Need an industry-standard, complete, quality-assured Perl. A good fit for all the platforms. Find and package the Perl modules required for each release. Ability to spend time building network management applications. Every AlterPoint customer runs ActivePerl as part of the AlterPoint distribution. No technical issues with the Perl distribution. AlterPoint helps some of the largest companies on the planet manage their networks. That’s a big job when Microsoft and Citigroup are on your client roster. Here’s the problem: the growing number of complex devices and logical overlay networks make it very difficult for network teams to maintain network security, access, audit and change control using manual processes. That’s where AlterPoint comes in. They provide automated network management tools and technologies that remove painstaking manual processes from network governance and administration. AlterPoint’s automation solutions make it easier, faster and more cost effective to run large-scale networks. AlterPoint believes in open source software. They sponsor open source projects-like ZipTie, the first open source community for network inventory management-and are an active participant in organizations like the Open Management Consortium. In their own software development, AlterPoint follows a “hybrid” open source model that combines open source software with value-added extensions. “Open source allows for collaboration. When more people get involved in software, the outcome can really improve,” said Ron Dovich, Vice President of Engineering at AlterPoint. So AlterPoint embraces open source. But not without a safety net. That’s why they added ActiveState’s industry-leading enterprise Perl language distribution, ActivePerl, into NetworkAuthority, their core network automation platform. Every AlterPoint customer runs ActivePerl as part of the AlterPoint distribution. “When we decided to use an enterprise distribution of Perl, we didn’t look at anyone except ActiveState. ActivePerl is the recommended distribution for anyone using a modern version of Windows,” said Martin Dessureault, Senior Development Manager. Developers around the world rely on ActiveState for a complete, quality-assured Perl distribution. ActivePerl enables vendors to take advantage of the benefits of open source in a controlled, tested and fully-supported manner. ActivePerl is regarded as the industry-standard Perl distribution for millions of implementations worldwide. ActivePerl is also a good fit because it works with all the platforms AlterPoint supports, including Windows, Red Hat Linux and Solaris. ActivePerl also supports other Linux distributions, AIX and HP-UX. Before Dovich’s team began using ActivePerl, it could take one developer up to a week to find and package the Perl modules required for each release. The process could become more time consuming depending on the number of new or changed modules. After programmers finished packaging the Perl modules, AlterPoint’s quality assurance team would get to work regression testing application functionality that depended on Perl. On average the QA team spent three days testing Perl-dependent functionality. “Another reason we went with ActivePerl is because the distribution is fully tested. We wanted our developers spending their time building network management applications not working through module dependencies,” said Dovich. Perl experts at ActiveState are always testing new modules for security, stability and quality before they are included in ActivePerl. That means ActivePerl is fully tested and quality assured by core Perl developers right out-of-the-box. AlterPoint typically releases 2-3 versions of NetworkAuthority each year. So, managing Perl in-house could add up to 24 days of developer time over the course of the year. Dovich’s team clearly saves development time and money by not managing and maintaining Perl in-house. Saving on time and development costs is appealing, but code quality is crucial. AlterPoint’s reputation is built on reliability and scalability. Dependability is at the foundational core of every AlterPoint product release. After all, when hundreds of customers—some of whom run the biggest networks in the world—are relying on your product, it’s vitally important that your software is solid. In the year his team has been using ActivePerl, Dovich says they’ve had no technical issues with the Perl distribution. ActiveState continually monitors and tests all updates to ensure that ActivePerl is always using the latest and most secure Perl release. “ActivePerl is meeting, if not beating our expectations,” says Dovich. 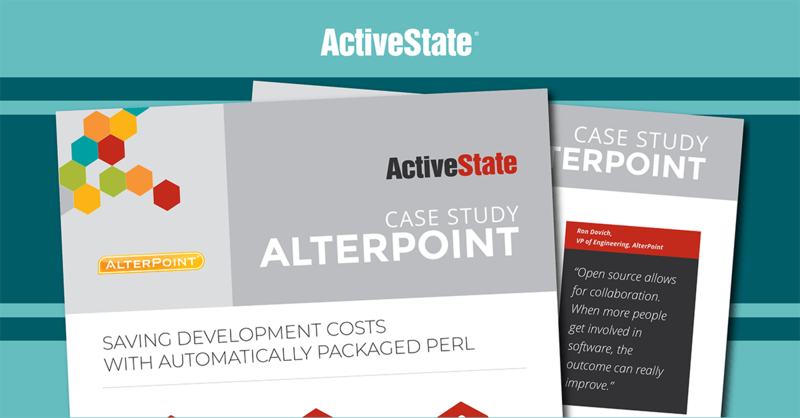 By using the OEM Licensing version of ActivePerl, AlterPoint enjoys some useful bonuses. For instance, ActiveState engineers are experts in their respective open source languages and are on hand to provide advice, answer questions and make suggestions. They can support AlterPoint on a variety of technical topics-from integration issues to platform support. Open source often prompts licensing questions and concerns. Because ActiveState OEM Licensing comes with out-of-the-box indemnification coverage for intellectual property, AlterPoint doesn’t need to worry about potential infringement claims from using Perl. By using ActivePerl instead of managing Perl in-house, AlterPoint saves up to 24 developer and testing days per year. Additionally, Dovich can be confident that the quality of ActiveState’s Perl distribution meets AlterPoint’s rigorous standards.